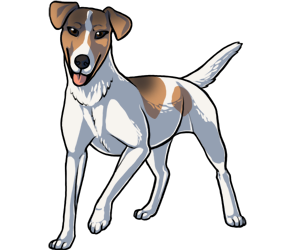 The Smooth fox Terrier is a breed that was brought up in the 17th century in the British Isles. The breed was created by mixing various breeds such as Beagles, Fox hounds and Dachunds. These dogs were kept by farmers to assist them with removing vermin and other unwanted mammals such as foxes. Although this breed isnt really used for what they were originally bred for, they still have their hunting drive within themselves. Presedent Herbert Hoover owned two of his own Fox Terriers. Their names were Sonnie and Big Ben.